A version of the popular DDR series, built for the single player. 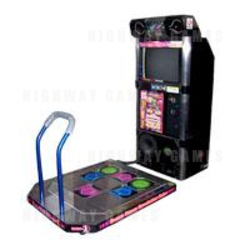 Unlike standard Dance Dance Revolution machines, games in the DDR Solo series only have one dance pad, however this dance pad has 6 arrows instead of the usual 4. The two additional arrows are Up-Left and Up-Right. The two diagonal panels are used in a new 6 panel mode. Because of the additional two arrows, games in the DDR Solo series are the only ones to feature this 6 panel mode. For the first time in DDR history, games in the DDR Solo series required the player to step on four arrows at once. To do this, the player must hit two panels with one foot, however the diagonal panels make this easier than it sounds. Because of the single dance pad, games in the DDR Solo series do not feature popular modes such as versus and double. There is also no beginner mode. DDR Solo 2000 features 36 songs and 9 Nonstop Megamixes.